How do we distinguish a crime from a terrorist attack? It’s a convoluted conversation that appears after every horrific mass shooting in America, and Sunday night’s Las Vegas attack—the deadliest in U.S. history—is no exception. Because of the history of racial and religious bias in conjunction with the word “terrorist,” folks on Twitter, including many celebrities, are using the platform to chastise the Trump administration and those who refer to the shooter as a “lone wolf” rather simply a “terrorist,” despite the amount of terror the shooting has invoked in citizens across the country. 50 dead. Over 400 in the hospital. And we continue to call this a LONE WOLF? Call it TERRORISM because that’s what it is. 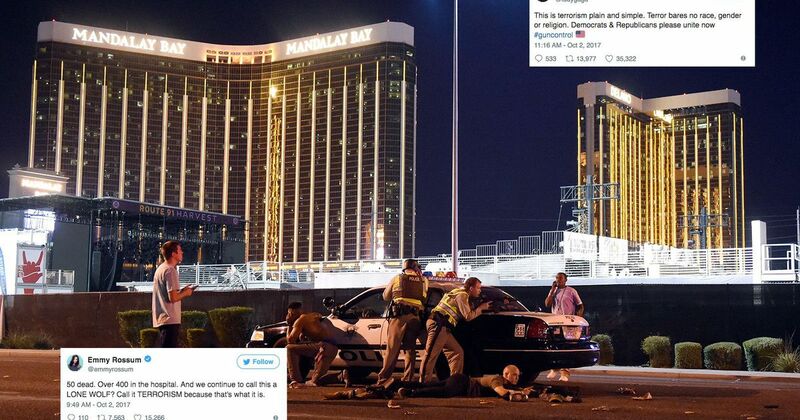 The worst mass shooting in US history occurred in Las Vegas. A white man opened fire on a music festival. Call it what it is. Terrorism. Domestic terrorism. It’s really not that hard to say. EVERY mass shooting should automatically be called “terrorism.” Later, the words “domestic” or “insert group name here” can be added. what happened in las vegas was an act of terrorism. do not sugarcoat it just because the attacker was white. call it what it is. This was terrorism. Calling it anything else is dishonest and dangerous. People need to know. Call it what it is. Domestic terrorism.